By Sophie Mullany, BScReviewed by Rebecca Woolley, B.Sc. HbA1c, also known as glycated hemoglobin, is produced when glucose in the blood sticks to hemoglobin, a protein within red blood cells required for the transportation of oxygen. As a rule, the more glucose in the blood, the more HbA1c is produced. People with diabetes have a consistently higher-than-normal level of sugar (glucose) in their blood. Because high blood sugar over a prolonged period can be very dangerous to health, diabetics must monitor their blood glucose levels carefully to ensure they do not get too high (or too low). This is why measuring levels of HbA1c, which is an indicator of average blood glucose levels, is a useful test to assess whether diabetes is being managed effectively or not. It can also be used as a diagnostic tool for this disorder and to highlight people at risk of developing it (called pre-diabetics). As red blood cells have a lifespan of approximately 3 months before they are replaced, measuring HbA1c can reflect how high blood sugar levels have been, on average, over the previous 3 months. How Does the HbA1c Test Work? The HbA1c test is used to measure the amount of glycosylated hemoglobin in the blood. It is recommended that people diagnosed with diabetes have an HbA1c reading every 3 to 6 months, and more frequently for those planning to start a family, having problems controlling their blood sugar, or who have had a recent change to their treatment plan. The test is conducted by a healthcare professional, using a blood sample taken from either the finger or from the arm. On average, normal HbA1c for non-diabetics is < 36 mmol/mol (5.5%). For people with diabetes, an ideal HbA1c level should be 48 mmol/mol (6.5%) or lower. 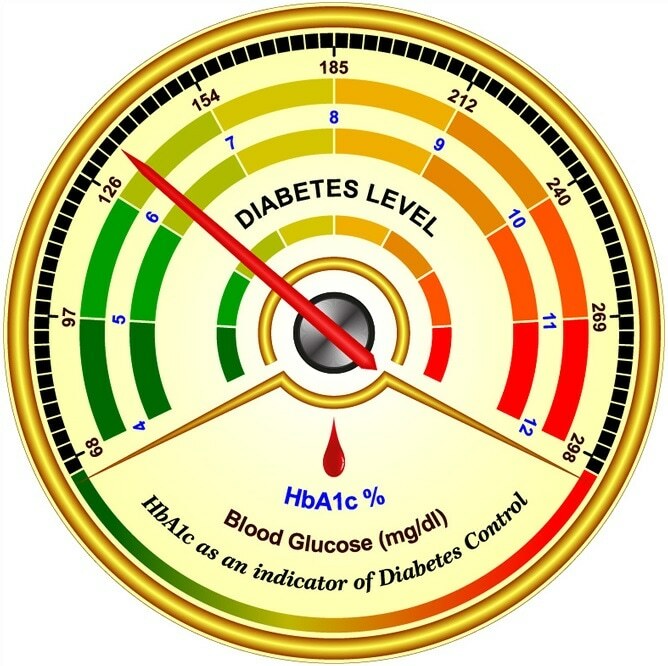 A HbA1c measurement of between 36 and 48 mmol/mol means that the individual it at a very high risk of developing Type 2 diabetes, termed ‘pre-diabetes’. However, it is important to remember that everyone is different, and that each patient will discuss with their healthcare team their personal target range to aim for. This individual target will take into account their current HbA1c level and how soon the next test is scheduled for. Persistently high blood glucose levels can be very dangerous to health. This is why it is important to carefully monitor and, if necessary, reduce levels of HbA1c. For example, several large-scale studies have demonstrated that lowering HbA1c by even as much as 1% (11 mmol/mol) can significantly reduce the risk of developing neuropathy (damage to nerve endings), retinopathy, diabetic nephropathy (kidney disease), heart failure and vascular disease. How Does HbA1c Differ from Blood Glucose? Even though HbA1c is a good marker of blood glucose levels, there are some important differences between the HbA1c test and the standard finger-prick test (another commonly used test for diabetics to monitor their blood glucose). Firstly, blood glucose level is the concentration of glucose in the blood at a precise point in time – this is measured by the finger prick test and is given in mmol/l. As this test only provides a snapshot indicator of blood glucose, it must be carried out multiple times a day, but can be done at home without the assistance of a healthcare professional. In contrast, the HbA1c test provides an overall marker of an individua’ls average blood glucose over the last 3 months, and is given in mmol/mol. This provides a better reflection of how the levels of sugar in the blood are being controlled over time, and thus can tell doctors how well diabetes is being managed and if any changes to the patient’s lifestyle or medication need to be made. However, as the reliability of the HbA1c test depends on red blood cells, it is important to remember that certain medical conditions, such as anemia, can affect the results.